The Kramer family unveils the marker at the dedication ceremony. Photo by Shelley Schippert. Cochran and her grandfather, Col.
for the characters in the novels. was based on Pewee Valley. Johnston, for the rest of her life. Shirley Temple was made in 1935. PEWEE VALLEY, Ky. (March 2017) – Even though she penned more than 40 books, Annie Fellows Johnston will always be remembered as the author of The Little Colonel series of children’s books. A Pewee Valley, Ky., transplant, she fell in love with the quaint, nostalgic atmosphere of the town and immortalized it in her writings. “Johnston was one of the first children’s authors whose books achieved international acclaim. The series was translated into over 20 different languages by the early 20th century,” said Nancy Stearns Theiss, executive director of the Oldham County History Center in La Grange, Ky. The newly re-opened Peyton Samuel Head Family Museum, located on the History Center’s campus in La Grange, contains an exhibit on Johnston and Pewee Valley. 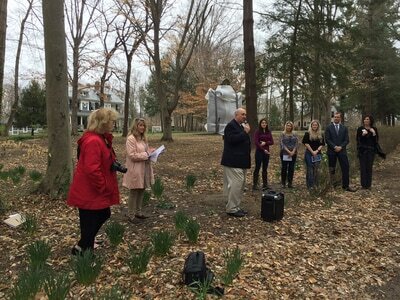 “The Little Colonel series was based on the real people and places in Pewee Valley in Oldham County,” said Theiss. 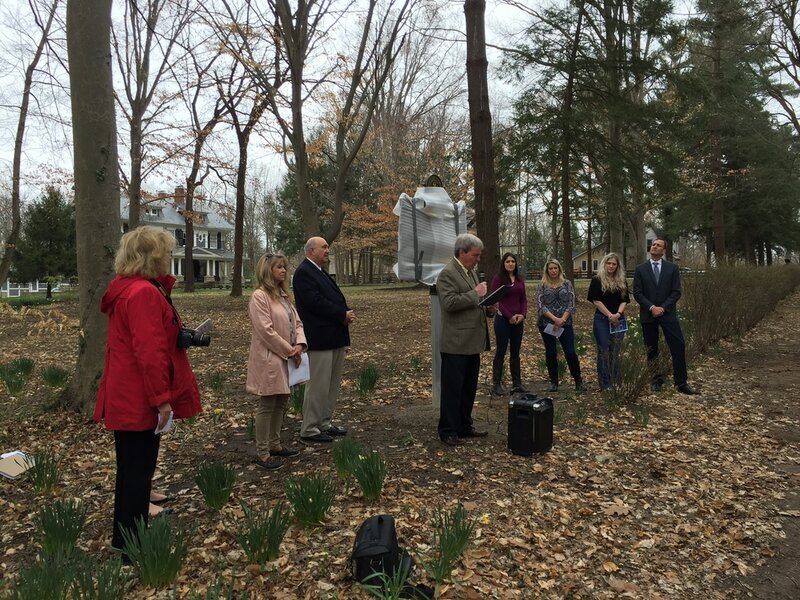 In an effort to remember Johnston’s tremendous success as a writer, the Oldham County Historical Society is teaming with Oldham County Tourism and the Kentucky Historical Society to place an historical marker in Pewee Valley near Johnston’s home, The Beeches. A public ceremony is scheduled for 11:15 a.m. Wednesday, March 29, at 125 Central Ave. in Pewee Valley. Scheduled speakers include Oldham County Judge-Executive David Voegele, Pewee Valley Mayor Bob Rogers and Pewee Valley Historical Society member Donna Russell. 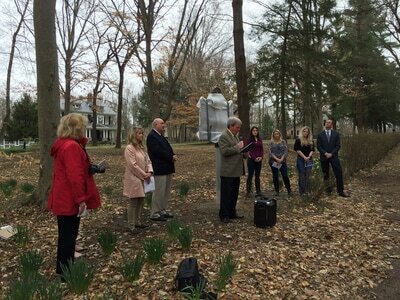 The marker unveiling is free and open to the public. At noon, a luncheon and program will follow at 314 Exchange, located at 314 Mt. Mercy Dr. A presentation about Johnston will be given by Sue Lynn McDaniel, an associate professor and Special Collections Librarian at Western Kentucky University. Cost for the luncheon and program is $30 for society members and $35 for non-members. Reservations are required since seating is limited. “Annie Fellows Johnston made Pewee Valley famous with The Little Colonel series,” said Russell. “While the town was a popular summer playground for Louisville’s elite from the 1880s and early 1900s, it was Annie Fellows Johnston who made it famous around the world.” In her books, the town became Lloydsboro Valley. 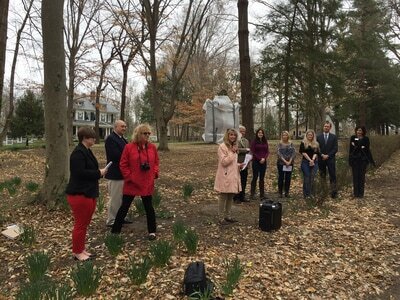 The Beeches, where the historical marker will be placed, was purchased in 1911 by Johnston from her friend, Mamie Craig Lawton, according to Theiss. Even this stately home made it into The Little Colonel books. The home had been built in 1902 by Mamie Lawton, widow of Major Gen. Henry Ware Lawton, an American war hero who was killed in 1899 in the Philippines. The Pewee Valley Museum, located inside Town Hall at 312 Mt. Mercy Dr., will showcase a special exhibit dedicated to Johnston and The Little Colonel. Admission is free and the museum will be open from 9:30 a.m. to 2:30 p.m. on March 29. Russell said display items will include The Little Colonel’s baby buggy, Johnston’s yellow powder box and walking stick (on loan from Suzanne Schimpeler), a Little Colonel board game and Johnston’s writing desk (on loan from the Herdt family), in addition to many other items. Annie Julia Fellows was born on May 15, 1863, near Evansville, Ind., during the Civil War. Her father, Albion Fellows, a Methodist minister, died when she was only 2 years old. Her mother, Mary Erskine Fellows, was left to raise her brother, Erwin, and two sisters, Lura and Albion, on a farm in McCutchanville, Ind. Johnston later credited her mother with instilling in her a love for books. In 1888, she married her second cousin, William Levi Johnston (Feb. 5, 1847 - Feb. 8, 1892), a druggist. Born in Vanderburg County, Ind., William received a bachelor of science degree from De Pauw’s Asbury College of Liberal Arts in 1869. During the Civil War, William joined the Union and was of a select group known as the “One Hundred Days” volunteers. He served in the 136th Regiment, Co. F. In 1864, his company was sent to Tennessee. There, they guarded the Nashville and Chattanooga, Tennessee and Alabama, and Memphis and Charleston railroad lines. Within eight months of applying for his Civil War pension, William had succumbed to tuberculosis. William’s first wife, Hallie Eaves, had died of consumption in 1883, leaving him with three small children – Mary Gardner (1872-1966), Rena (1877-1899) and John Eaves (1881-1910). The children were partially raised by their uncle, Albert W., and aunt, Lurena Ingram (Eaves) Burge, Hallie’s sister, in their lavish Pewee Valley home, Delacoosha. The Burges introduced them to a more glamorous lifestyle to which they were accustomed, including live-in servants, carriage rides, parties, lawn tennis, picnics and many society events. In turn, the stepchildren introduced Johnston to the area. 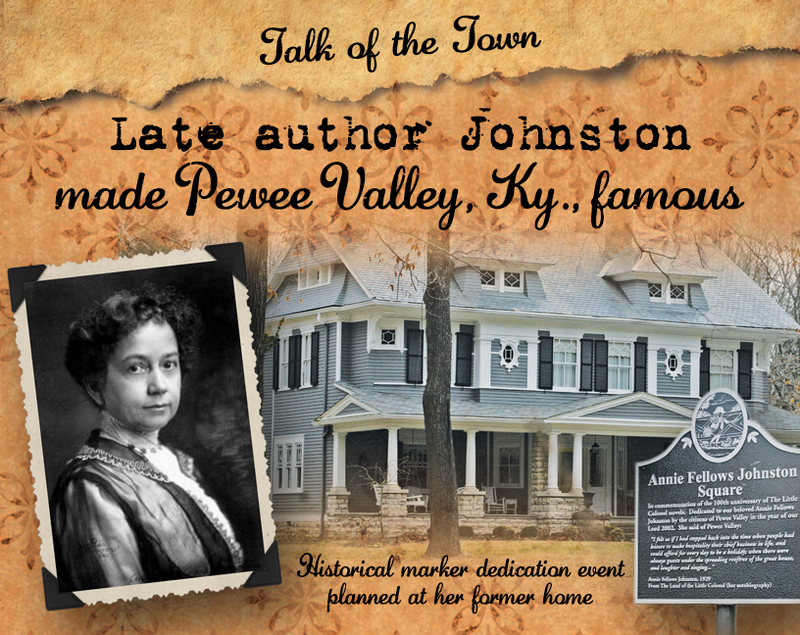 When she turned to writing to support herself and them after the death of her husband, Johnston knew she had the perfect setting for her novels in the quaint little town of Pewee Valley. The main character was based upon a fiery little 5-year-old known locally as “The Little Colonel.” In actuality, The Little Colonel was Hattie Cochran. Her grandfather, known as the “Old Colonel,” and the era in which he lived, made as much of an impression on Johnston as did Cochran. A new exhibit on The Little Colonel novels is part of the newly renovated Peyton Samuel Head Family Museum in La Grange. She immortalized them both in her novels. Col. George Washington Weissinger was a Confederate veteran. Mary Gardner Johnston was 15 when her father married Johnston. After his death, Johnston and the children continued to live in Evansville for five years. In September 1897, Mary and her sister, Rena, were living in Pewee Valley with the Burges. Johnston had enrolled John in the nearby Highland Park military school. To earn extra income, Johnston went on a European tour working as a companion, governess and chaperone for a young lady. By 1898, Johnston had moved back to Pewee Valley to be with the children, and they moved into The Gables. A year later, Rena, 21, fell ill with appendicitis. Six days later, she died after having an operation. By this time, John suffered from consumption, the disease that killed both of his parents. He and Johnston moved to New York, Arizona and California, finally settling in Texas in 1905 for his health. Mary stayed behind in Pewee Valley. John had fought tuberculosis for 10 years. He died while living in Boerne, Texas. Johnston had purchased a home she named Pen Acres, but upon John’s death, Mary persuaded her to return to Pewee Valley in 1911. Johnston bought a home known as The Beeches, which today is a private residence. Mary, who became an artist and created some of the artwork for her stepmother’s books, was the only surviving stepchild who moved into the home with Johnston. After Johnston’s death on Oct. 5, 1931, Mary “worked to protect her stepmother’s legacy,” said Russell. Johnston is buried in Oak Hill Cemetery in Evansville. “Annie’s legacy helped keep certain things from happening that would have ruined Pewee Valley,” Russell said. She cited a 1937 incident as a prime example: The state wanted to erect a new women’s prison on the site of the former Kentucky Confederate Home in downtown Pewee Valley. Another reason for the popularity of The Little Colonel books was the 1935 Twentieth Century Fox movie starring Shirley Temple as the Little Colonel and Lionel Barrymore as her grandfather. Of the 35 Pewee Valley homes, churches and other properties on the National Register of Historic Places, The Beeches is probably the most well-known, not so much for its architectural charms, which are substantial, but for the people who lived here. For 20 years, from 1911 to 1931, it was home to children’s author Annie Fellows Johnston. She brought Pewee Valley world-wide fame with her popular “Little Colonel” series, started in 1895 while she was visiting Pewee Valley and completed here, at The Beeches, in her second floor office in 1912. For many years, both before and after Annie’s death, The Beeches was a Mecca for Little Colonel fans, attracting as many as 98 visitors in a single day. People came to see the real places that were mentioned in the books -- not only The Beeches, but The Locust, The Gables, the Post Office, the Pewee Valley Presbyterian Church and the Little Colonel’s cottage on Maple Avenue –"All just as she described it, you know," noted one visitor from England. And even before Annie moved into The Beeches with her stepdaughter, Mary, the house and its occupants were part of the Little Colonel stories. It was built by Mamie Lawton after her husband, General Henry Ware Lawton, was killed in the Philippines during the Spanish-American War. Mamie and Annie had been friends and confidantes since they met in 1898, when Annie was renting The Gables, across Central Avenue from Edgewood, where Mamie grew up. It was here at The Beeches that Mamie finished raising her four children– three girls and a boy -- and the house rang with laughter during the Lawton years. There were teas and dances, house parties and kimono parties, campouts and play rehearsals, meetings of the Pewee Valley Presbyterian Church’s ladies aid society, trips planned to the healing waters of Martinsville Springs and to the dedication of the Lawton monument in Indianapolis. Annie’s inspiration for the Little Colonel herself, Hattie Cochran, spent many golden hours playing on the porch with Frances, Catherine and Louise Lawton – the inspirations for Allison, Kitty and Elise Walton in the Little Colonel stories. For the last two weeks I have been struggling with "The Little Colonel's Hero" to the exclusion of everything else, and writing to all points of the compass for facts and figures. You will be interested in it, I know, being the lady who suggested it to me. Do you remember the day we dined at Mrs. Warfield's, when you crossed the room and showed me the picture of the Red Cross War dog? Well that is the Hero, only I have changed him from a collie to a magnificent St. Bernard. The Little Colonel is to go abroad in this book. In Geneva she comes into possession of Hero, in a dramatic way, and there in that home of heroes and in the cradle of the Red Cross movement itself, she becomes acquainted with the history of the Association and all that it has accomplished for humanity in the times of flood, fever, famine and fire as well as war. Today, Clara Barton sent me a pile of reports and histories and speeches concerning it, which will help me amazingly. I wanted to ask if you have ever met her, and if you have, if there was anything in your acquaintance which I might be given in this story to add a personal touch to this work. Also, did the nurses, ambulance corps, etc, in the Philippines work under the flag of the Red Cross? …They all return to the Valley in the fall where they find the Waltons ensconced in their new home in the country. Mamie also appeared, disguised as Mrs. Waldrop, in Annie Fellows Johnston’s later books, “Georgina of the Rainbows” and “Georgina’s Service Stars,” published in 1916 and 1918. ...If Miss Johnston took everyone upstairs who came to the Beeches, the stairs would have worn out a generation ago. And people are still coming. They are young and old, they come before breakfast and after supper. They are "just driving through," as two middle-aged couples told me when I met them there on their way from Florida to Providence, R.I., "a little out of the way, but when we realized we were within a few hundred miles, we had to detour." Mary also sold the movie rights to the “Little Colonel,” the book that launched the series, to Fox Studio. On February 22, 1935, the film, starring Shirley Temple and Lloyd Barrymore, premiered at Louisville’s Rialto Theatre. The next day’s Courier-Journal estimated the opening-day crowd at a record-shattering 15,000. One of Mary Johnston’s fondest wishes was that after her death, the Pewee Valley Woman’s Club would purchase The Beeches as a clubhouse and preserve it as a memorial to her stepmother. Unfortunately it wasn’t meant to be. On December 31, 1967, The Beeches became home to four generations of the Hollenbach family, headed by Philip Hubbuch Hollenbach, the man who directed the Little Colonel Players’ very first full-length production in 1958. Phil served as the Little Colonel Players’ director for 16 years, from the time they started producing plays at Valley Camp off Maple Avenue through their move to the present Little Colonel Playhouse on Mt. Mercy Drive. He bowed out as director in 1974 and was named Director Emeritus in August 1984. In 1989, The Beeches was placed on the National Register of Historic Places as part of Pewee Valley’s Central Avenue Historic District. And in 2010, under the ownership of June and Chris Kramer, it was beautifully restored and updated to its present appearance. 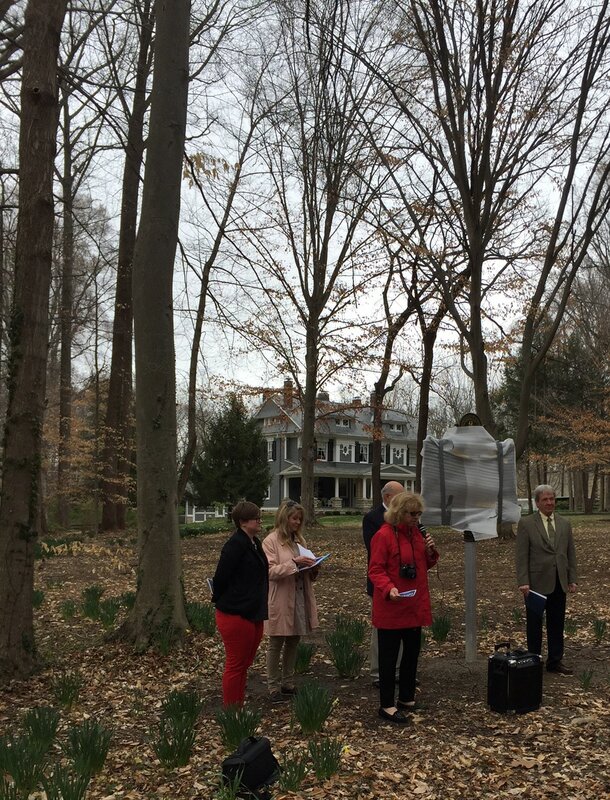 Many, many years ago, a pilgrim from Chicago had such a hard time finding The Beeches that he took it upon himself to erect a neatly-lettered sign at the entrance: “The Beeches – Annie Fellows Johnston.” Today, The Beeches is getting the marker it has long deserved, thanks to the generosity of Oldham County Tourism, the Kentucky Historical Society and the Oldham County Historical Society.